Hi friends - We are so excited to get this new year started. Effective this summer, the St. Edith and St. Colette group has officially registered a MOMSNext ministry to expand growing group. Last year we ended with over 70 registered mamas and the need for a ministry of school age mamas was there, we recently graduated several of our moms out of MOPS who expressed their interest in staying with out group to help them navigate the new waters of school age kid life. So it's with great excitement we announce we are officially St. Edith and St. Colette MOPS and MOMSNext. So whether you are a returning seasoned MOPS member or checking us out for the first time, our hope is you find encouragement, support, relevant teaching and opportunities to grow and develop relationships with other women who are in the same season of life. If you are thinking about checking out our group, you will be immersed in conversation with other mamas regarding a variety of topics including friendship, anger, creativity, resilience and growth, kindness and so much more. We also bring in several speakers, sit around and do crafts with each other without little hands in the way. We sit down and have a nice hot breakfast and discuss all the good and bad going on with our lives. It's beautiful and exactly what us busy moms need. 2 hours to sit down with a HOT cup of coffee, a HOT meal and catch up with girlfriends uninterrupted because your kiddos are just a few feet away in their classrooms playing with their friends, doing crafts and listening to music while having a dance party. Each year, MOPS International introduces a new theme with new discussion ideas and topics for us to explore and this year we are talking about "We are the Starry Eyed" where we will examine light and dark, hope and fear, kindness and risk, wonder and mundane. So what does Starry Eyes mean for us moms? Starry Eyed means looking for the light even when darkness is enveloping. It is an opportunity to hope recklessly and to witness God’s presence guiding things seen and unseen, comfortable and uncomfortable. If you are brand new and thinking about checking out a meeting, the first one is on us! 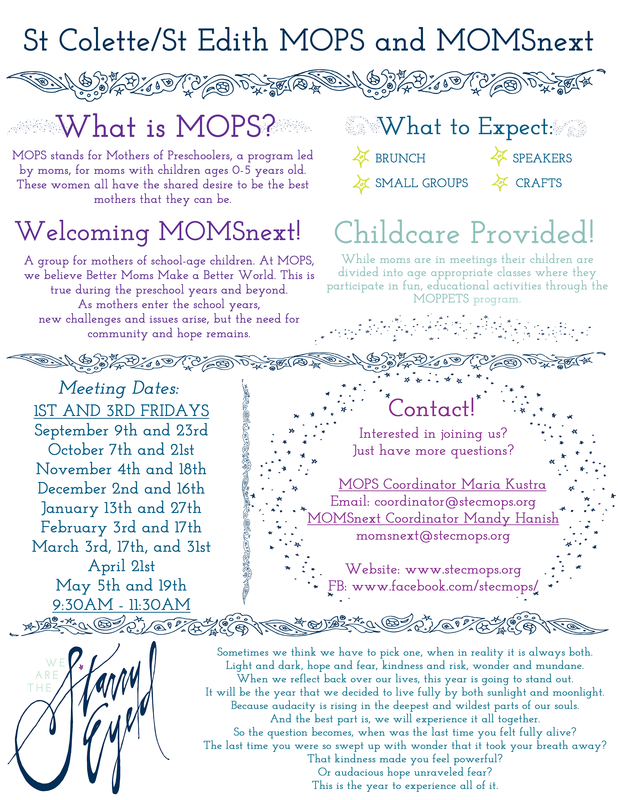 Send me a quick e-mail at coordinator@stecmops.org if you are pregnant to kindergarten or to Mandy Hanish if you are interested in joining MOMSNext with school aged kiddos at momsnext@stecmops.org. We really look forward to hearing from you! If you are a planning on joining and/or returning please take a moment to fill out or local registration. The first form is for the mom to register herself with the group and the second is for our MOPPETS program where you will be dropping of your child while you go have some fun! We pray that you will connect in significant ways and feel at home in our group. Please never hesitate to reach out to us directly!